This is definitely one for the chocolate lovers out there - dense rich and chocolatey! This recipe comes from the Good Housekeeping Baking Book, and turned out pretty well. This was definitely an experiment for me - I made my first pie crust ever, and the fear is largely over. For those of you yet to venture into the dark scary world of pie crust, its basically a mix of flour, salt, cold butter, water and shortening. At least, thats what my recipe calls for, but I didn't have shortening on hand so I substituted a little butter and a little oil instead. Oops! I think it turned out ok anyway. Anyway back to the crust. So you mix that together and chill it for a while, then roll it out (surprisingly easy) and line the pan with the dough and chill it again. All seemed to go as planned, and then I had to do what is called in the baking world "baking blind." This means that you bake the pie crust without the filling. Generally, you will use parchment paper or foil on top and fill it with pie weights - you can buy these or use dry beans or uncooked rice instead - which serves to weigh the crust down while baking, so it retains its shape for the filling. Here is what it looked like: Fascinating, no? 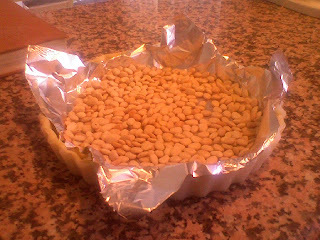 Anyway, I baked the crust acording to the directions, removing the weights after 20 minutes. The edges got a little brown and brittle, but nothing major seemed to go wrong. Practice makes perfect, right? 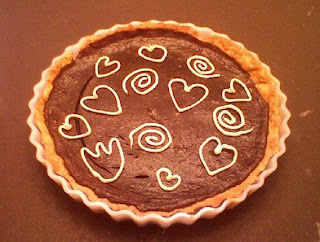 The rest of the filling creation went well, and the recipe called to decorate the tart with white chocolate hearts, but clearly, I didn't feel constrained by that. Hearts, flowers, swirls - anything goes! You could even write words and draw pictures for decoration as well. The recipe said to serve chilled, but we prefered it a little closer to room temperature. Beware - this recipe is only for chocolate lovers - its very rich! Tip of the Day: Keep dry beans on hand specifically for using as pie weights, that way you can reuse them each time without throwing them out. But be careful to keep them separate from your other beans - they won't taste very good if you try to cook them! With pastry blender or two knives cut in butter and shortening until mixture resembles coarse crumbs. Sprinkle in ice water, one tbsp at a time, until dough holds together. Shape dough into one disk and refridgerate for 30 minutes or overnight. Roll out dough into 11 inch circle, and line 9 inch tart pan with dough. Prick with fork and chill for 30 minutes. Line with foil and fill with pie weights, bake at 400 F for 20 minutes. Remove foil and weights, bake for an additional 10 minutes. Melt chocolate and butter over low heat, stirring frequently. In small bowl with fork or whisk, lightly beat cream and eggs. Blend some chocolate mixture into egg mixture, then stir egg mixture back into chocolate. Bake 20 minutes or until custard is set. Cool on wire rack, refridgerate to serve chilled. Decorate with white chocolate hearts decorations!